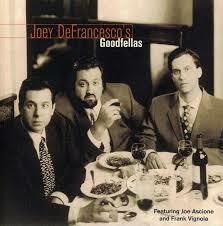 This time I’d like to talk about an album with two of my favorite jazz musicians (I have seen both of them multiple times) from 1999: It’s Joey DeFrancesco’s “Goodfellas” with Frank Vignola on guitar and Joe Ascione on drums. A classical organ trio where these three musicians of Italo-American background play a mix a classic jazz tunes and great Italian songs. The CD starts with “Speak Softly Love”, the theme from the movie “The Godfather” and it shows what these three guys have in mind on the CD: Play great melodies and swing perfectly. I have seen Frank Vignola several times and he really likes to play all these great melodies from the American songbook, from classical European composers or from traditional European music. Joey DeFrancesco is also a person who likes to make music, to play to entertain and to swing hard. His playing is more blues inspired and the CD also features this music in “Whack’ Em”, “Goodfellas” and “Ya See What I’m Sayin’?”. Finally, Joe Ascione has been working with Frank Vignola many times so these tow guys knew each other very well and also had a very similar understanding in what and how to play. The CD has been recorded on two days in 1998 and according to producer John Burke, the most of the songs “are first takes, without any rehearsal whatsoever”. Very impressing. I don’t have Italian roots but many of the songs like “Volare”, “Fly Me to the Moon” or “O Solo Mio” are songs that I have heard many times and their melodies are familiar, but again, what these three guys make with them on this CD is still impressive and surprising. The guitar solo on “Fly Me to the Moon” is in my opinion the best guitar solo I ever heard on this tune. It starts simple with the melody and ends up in a mandolin style tremolo. The organ and guitar solo are played very dynamically, both start rather soft and end up very hard swinging. This is really a perfect interpretation of this classic jazz tune. The last song the CD called “Whack ‘Em (Reprise) / Tarentella” catches the spirit of this recording. Three guys who share a very common understanding what Jazz music is all about come together, have fun and produce a timeless record.